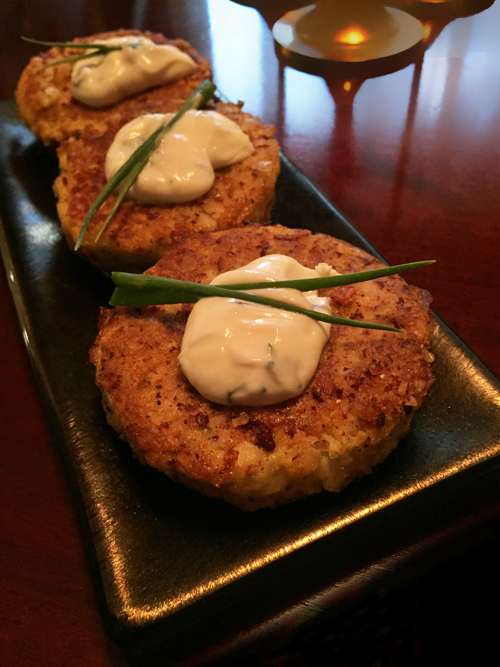 I can't remember the last time I had crab cakes. The breading, the frying, it's just not worth the trouble. That said, when my neighbor went crabbing on the Oregon coast, I couldn't say no to this offering. The challenge was to enjoy the meal and not the guilt. I get it, I could have eaten it right from the shell, or in a salad but I haven't posted in a while and I needed the challenge of developing a new recipe. Recently someone posted a recipe where they added cauliflower to the crab meat in place of bread. I figured that was a pretty good place to start. Also, I love the mild taste of crab and I didn't want to overwhelm it with a strong-flavored sauce. So I tweaked my lemon yogurt salad dressing and served a dollop on each cake. Given the feedback I've gotten from the lemon cream sauce I blogged about, I think you'll like this. If not, go back to a dollop of mayo or a drizzle of aioli -- just don't tell me about it if you go with ketchup! Here's what I came up with. No mayo, no bread, and no frying. These were cooked on top of the stove in a covered nonstick pan that was rubbed with a little olive oil.